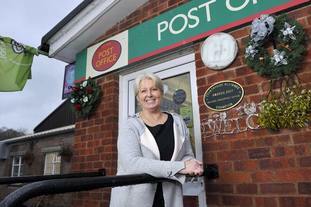 A Post Office is offering a free Christmas Day dinner to people who would otherwise be alone. Postmistress Sonya Carey and her husband Nigel will open their branch at Pontrilas in Herefordshire and cook meals with food donated by local farmers. The couple will even pick people up and take them to a cafe which runs alongside their branch. MsCarey said: "My own family are all grown up and spend Christmas day with their own families which means I can spend the 25th giving back to our community. "Local residents have said that our Post Office is the glue to this community – and it’s hearing things like that that make our efforts all worthwhile." Tom Moran, Network Development Director at the Post Office said: "Our branches are at the heart of communities across the UK and we know how much people rely on our services in the run-up to Christmas. "Most people will of course be taking a well-deserved break to enjoy Christmas Day with family and friends. So we're extremely proud of people like Sonya who provide so much more than Post Office services to their customers, not just at Christmas but throughout the year." More than 60 million people are expected to have visited Post Offices by the end of the festive period, including many on Christmas Day.